My morning routine consists of a shower, a fresh coffee using one of my favorite coffee machines and a look at the newspapers. Oh my god, I’ve grown up. Not that I didn’t used to shower when I was younger, but I certainly didn’t drink coffee and read The Times. Sometimes things grow on you – a bit like a mole or a wart. Like my new grown up lifestyle, I’ve come to love it – although the thought drinking Brazilian roast and keeping up to date with the financial section in the UK’s most pretentious newspaper wasn’t exactly a thought that would have ignited my fires all those years ago. Quite frankly, it would have bored me. What does any of this have to do with ModNation Racers: Road Trip you ask? Well, it’s grown on me. ModNation Racers for the PS Vita is one of those titles that takes some getting into – and on first glance, it doesn’t offer a lot. 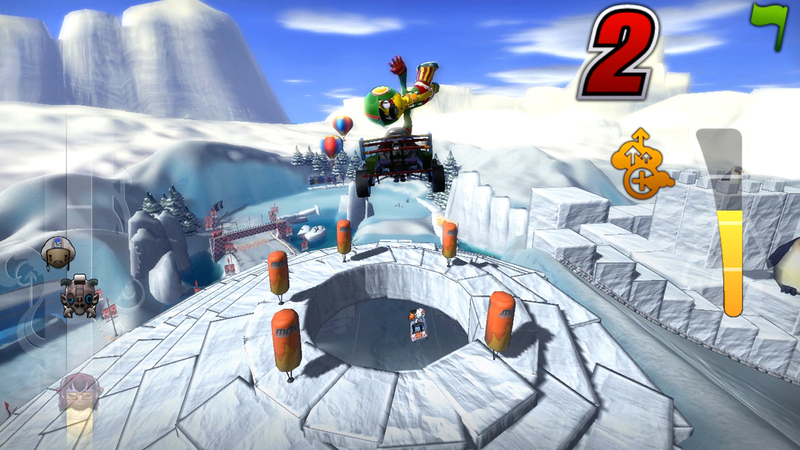 The soundtrack is pretty dull; it’s a couple of the same tracks looped while racing and during menu intervals. There are not many exciting sound effects either; it’s not a thrilling experience for your ears. Visually, N does okay, but the menu systems don’t look remotely HD so they look really dull and washed out on the OLED screen that the PS Vita proudly presents. When you’re not on a screen that shows a menu, the tracks are nice and cartoony, and the weapon effects look good, but the level of polish here for a full priced PS Vita title is pretty minimal. The main attraction, I thought, would be the track editor. I remember playing the PS3 version and crafting some beautiful tracks, but the PS Vita makes hard work out of something that should be pretty easy. You start off by drawing your track on the touch screen (very good) and then you can scroll around the track with the back touch panel (which can be a fiddle) raising or lowering your track to add diversity – so far, not bad. When you come to placing props on there though – jumps, obstacles, weapons, trees and decorations – it’s not the easiest of affairs. You place by touching the screen – but wait – you pressed the wrong part of the track. How do you delete it? I literally scratched my head for 10 minutes until my scalp was red raw. The help system didn’t offer any valuable advice, and when eventfully I figured out how to do it, I was posed with another dilemma. How do I rotate these ramps so they actually point in the direction I want to drive in? Well guess what? Now I have no hair left. It’s very hands on, as the game supports the touch screen quite a lot, but the lack of tutorials and help leaves you with quite a saving on shampoo bill at the end of the day. Right now, ModNation Racers looks about as appealing as drinking coffee and reading newspapers – ten years ago. But, if there’s a lesson to be learnt in life, it’s that perseverance can pay off and things can grow on you. ModNation Racers: Road Trip did. What’s refreshing about this title – if we’re comparing it with the likes of Mario Kart – is that there are multiple layers of gameplay. You have a power meter which you fill up while racing around the track in various ways; drifting around corners, knocking into rival racers, firing weapons at them, doing stunts in the air, anything other than normal driving will fill your meter. At any time, you can use juice from your meter to increase your racing speed by speed boosting which lasts as long as you hold the boost button for, or until the power meter runs out, whichever comes first. You can also use your power meter to give you a temporary shield to protect you from the devastating weapons found scattered throughout the track. The weapons in ModNation actually make this game for me. There are many weapons available, from bolts of lightening to flame throwers, from ice blasts to pesky mines, all the clichéd projectiles are here, but it doesn’t end there. Once you collect one weapon, you can either use that weapon, or collect another weapon, power up and upgrade that weapon to a maximum of three tiers. The third tier can be truly devastating to your opponents. Mines become massive toxic gas clouds, bolts of lightening become full on storms, rockets become air strikes and your pebble bullets become massive landslides. The list goes on, every weapon doing insane amounts of damage, changing the dynamics of the race, hopefully in your favor. You can also swap your weapons for juice on your power meter; the more charged the weapon, the more juice you’ll receive, so this is handy if you have a fully charged weapon but you’re already in first place – swap it for juice and boost yourself to the finish line. Ah, it’s the simple pleasures in life. There are multiple challenges on each racecourse to complete, hitting these targets will open up more mods for your custom tracks, karts and characters. Even if you don’t touch the track editor, you can make your character look a lot like you (within cartoony reason) and pimp your ride until your hearts content, it’s all very novel. When you take away the mods from ModNation, you have a wicked karting game with plenty of weapons, power-ups and fresh ideas to make Mario Kart look a bit pants. So is it unfair to penalise ModNation Racers for its hit-and-miss mods? Not really. You can download hundreds of ready made tracks to keep things fresh; you can even download characters and karts if you really can’t be bothered tweaking them yourself. 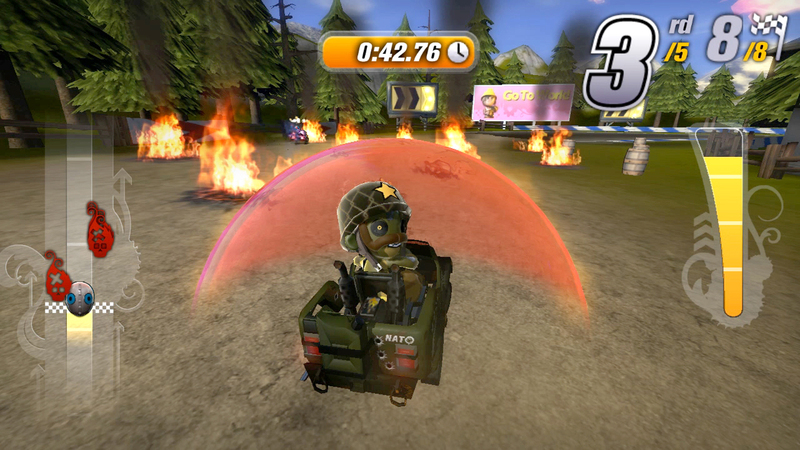 There’s plenty of content in this game, some of it is quantity over quality – and it’s a shame the AV department took a back seat – but at it’s core ModNation Racers is exciting kart racing game and a welcome addition to the PS Vita launch line up.